If a name given to a bird species fits its appearance perfectly, this is surely one fine example. With a total length of only 3-1/4 in. 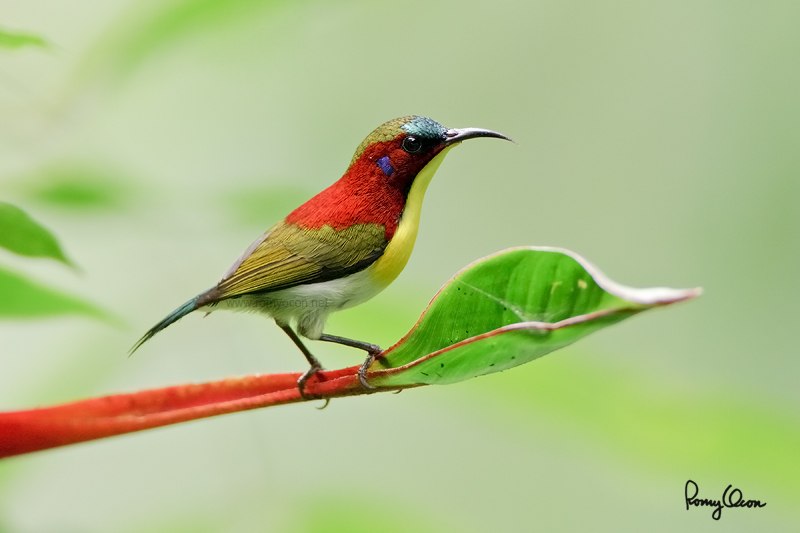 to 3-1/2 in., this is the smallest among Philippine sunbirds. The posted photo here is only 800 x 533 pixels, yet the subject will already appear larger than lifesize on most displays. The male is so brightly colored, with an amazingly iridescent crown. Such beauty however is not easy to appreciate in the wild with the unaided eye because of the tiny size of the bird and its very active nature. An observer is allowed only fleeting glimpses of this diminutive avian hunk. This particular individual was feeding among the flowers of some birds-of-paradise plants in the lower slopes of Mt. Makiling when I got a frame-filling capture. Available light was very tough to control, but I shot in RAW and this allowed me to recover much detail in the shadows and in the highlights. The clean background, the classic pose and the symmetry of the curves of the bird's underside and the perch place this image among my top favorites. 700 mm, f/5.6, ISO 800, 1/60 sec, manual exposure in available light, 475B/3421 support, near full frame.